Over the years, Asher released 13 new-age albums containing both instrumental and vocal tracks, before moving more towards the singer-songwriter genre. This Love is a compilation of original vocal new-age classics from those albums, including the very popular title track, Asher's version of the traditional 'Greensleeves' and the sublime 'Gloria'. This Love is the first in a trilogy of compilations drawn from Asher's ever-popular and timeless new-age material. The fully orchestrated, beautifully produced songs are gentle, melodic, intense and profound, full of longing and a tinge of melancholy, but also hope. 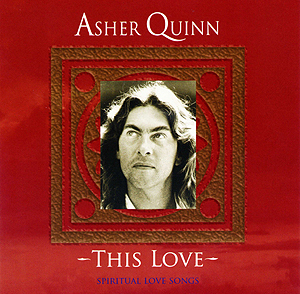 Asher Quinn’s This Love is a thematically cohesive collection of tracks salvaged from six now out-of-print albums released on the New World Music label between 1990 and 1996. As the title indicates, this compilation is all about love, be it the conventional musical type of love between two humans, a love for a higher spiritual power, or a love for life itself. A creative force for over 20 years in the realm of new age and spiritual music, Quinn has shifted over half a million records worldwide while dabbling in both the instrumental and vocal aspects of the form. In creating his meditative, relaxing sound, Quinn employs techniques and sounds that span 500 years of musical evolution. On these tracks, the instruments and production tools of modern ambient and new age music are applied to age-old song structures and lyrical romanticism. Therefore, the album is full of the soothing juxtapositions that make New Age music what it is in the first place. Slow-breathing synthesized sounds form a peaceful backdrop while massively understated guitar and keyboard embellishments add a minimal amount of flair. Quinn’s vocals are appropriately restrained and the subject matter calming. Quinn’s longevity and obvious accomplishments in the genre aside, his music may not appeal to listeners that don’t already hanker for new age music. Try selling these lyrics, which appear in the dreamy 9-minute long 'Gypsy Madonna,' to the average music fan: "Now I’m dreaming we are flying on a white horse in space/to the holy, misty mountain, I look at your face." The apparently numerous New Age devotees who know Quinn by the familiar appellation 'Asha' will undoubtedly champion This Love for bringing together these swooning, lovelorn folktales under one CD case. Many pop music fans will take one look at the liner notes, which not only relay Quinn’s tales of personal wounds, spiritual retreats and mystical unions, but also list the recorder as a featured instrument, and move on. That’s the risk any artist takes when they deal is such partisan forms. New Age and Classical music fans often view pop music as knuckle-dragging pablum, and rockers similarly regard the opposing styles as whiny, overwrought melodrama. Given his success, Asher Quinn has obviously made the most out of the minority audience available, and This Love will assuredly become a staple among the listeners that populate that musical world. I love your music, and my wife and I even used 'Come away' as our wedding march! Hi! I'm looking for the 18-minute track of 'Come away' that I hear on Sky FM. Is it for sale and where can I get it? I accidentally discovered your music a few days ago while listening to an Internet New Age radio station. The song 'Come away, come away' was playing, and I started to listen to the lyrics and was touched by the voice, a voice that reminded me somehow of Cat Stevens, Bob Dylan, Dave Lambert and James Blunt. I loved the lyrics, they sounded so true and heartfelt. I just LOVE your music, and my 86-year-old mum, who's really a classical music lover, is now hooked and thinks your lyrics "beautiful, like musical prayers". She's even thinking about requesting one of your songs to be played at her funeral... 'My redeemer'... please God that won't be for a long time yet. I first heard you singing 'Come away' on a flight from Los Angeles to Bangkok in the late 90's, and I fell in love with your voice and your music. Your song 'This love' is just everything that I think and feel myself, and I couldn't believe that someone else was actually putting everything into words for me - I nearly burst into tears. I feel so happy listening to 'Allelueia Moonshine'! Dear Asha, I lead the dances of Universal Peace here in New Zealand, and I have put a dance to your song 'Gloria', honouring the glory of God, within & without. May I have permission to lead this dance to your music, please? Blessings, Shanti. 'Come away, come away' is one of the loveliest songs I've ever heard. I cannot imagine ever tiring of it. I am especially moved by 'Hallelujah moonshine' and the prayer which follows. I often play it at my seminars. I LOVE your CD's! I unsuspectingly put on "This Love" whilst doing the washing up, and just the first vibrations of your voice, which felt like a frequency I'd known through many lifetimes, went straight through all my defences and I started sobbing. I particularly enjoy 'Greensleeves' and 'This love' as well as all of the album East of East, by the way.